Avoid Infant Helmets. Stop Feeling Like A Failure. Scientifically PROVEN, gentle, SAFE techniques by a Board certified physician, and typically half the cost of a helmet. As a dually board-certified physician who has spoken on the Whole Mother radio show multiple times, taking care of and helping enhance the quality of life of new person is my passion! Are you worried that your baby’s head is not shaped correctly? 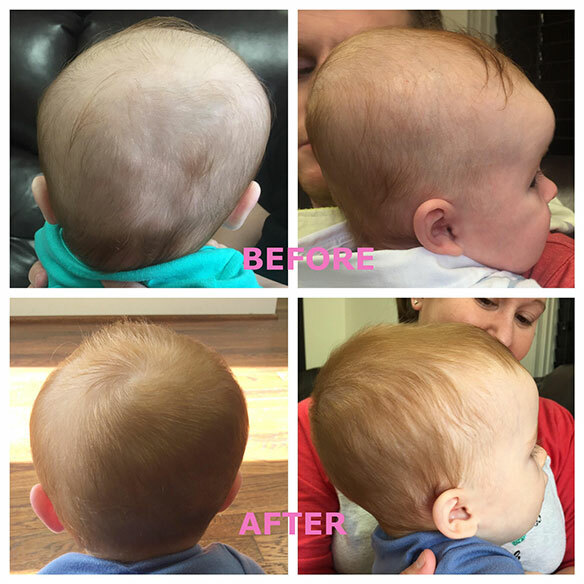 Are you worried about your infant with a flat head? Have you been looking up baby helmets for flat heads? Are you looking for another option to using a Doc Band helmet made by Cranial Technologies, Hanger Cranial Band, or STARband? If so, let me tell you a story. On a beautiful spring morning, five months ago, two individual women had their first child in neighboring rooms at the same place. The two babies were very much alike. Both of them had no complications after a vaginal delivery, both had healthy 7.5 pound boys which were born minutes apart. Both were discharged within 48 hours –as most deliveries are – and the parents were filled with awe, hope, and dreams about how to give their child a better future. Six months later, these two women bumped into each other at a nearby coffee shop. The two kids were still very much alike. Both were happily cooing developing children, and… also had lopsided heads. And both parents, it turned out, felt like failures for having children with flat spots despite changing crib positions, tummy time, placement in the tub, and the “typical” pediatrician talk about helmets. Both shared the fear of family and strangers judging them. “What’s wrong with your baby?” “What did you do wrong?” What happened to him?” But there was a difference. One of the children’s parents was choosing stickers to decorate her son’s helmet. The other found a rare and exclusive physician to reshape her son’s head with no embarrassing gear. You probably have not heard of our type of medicine and that’s okay. There are less than 1200 of us across the country who spent over 10 years training to become dually boarded with this specialty, and even fewer that focus on infants. No, we are not chiropractors or physical therapists or doing infant massage. 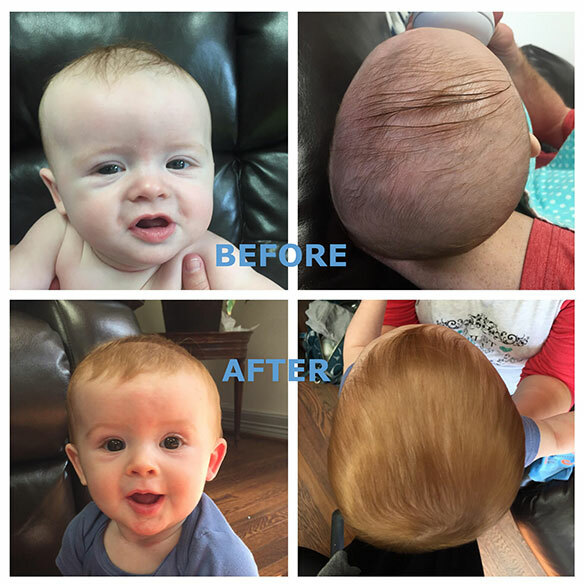 We aim to be your trusted physician, and have the scientific literature to educate our fellow physicians, including your inquisitive pediatrician as to how we can help reshape flat heads without using a helmet. YES, I’M READY TO LEARN THE TOP 22 QUESTIONS ALL PARENTS ASK, AND WHAT TO DO NEXT! Especially if you use your hands to treat infants, and you are not a chiropractor or physical therapist. Watch the video below to see. Maybe you can relate to the synopsis of Ashley’s eloquent explanation of her journey to understand the D.O. difference (used with her permission – read the full article on her blog at http://naptimetales.com). “We had a nice long talk with our pediatrician about helmets and doctors to see because that’s just the “typical” thing to do when your kid has a flat head. I was just wrapping my head around the fact that my son was going to wear a space helmet when the doctor was silent. I could tell he was thinking and after a bit he said he knew a “magician” that, if we were open to the method, would be able to fix his head with no gear. Our baby’s doctor told us in so many words (and as gently as he possibly could) that my sweet son’s head would be squeezed back into shape with the “magician’s” bare hands. Total. Voodoo. I didn’t think it would work and I thought it sounded insane. Buuuuuuut I really wanted to avoid a helmet. We agreed to see this head squeezing doctor so we could ask lots of questions and then go from there. I was feeling good about things after I did some at home research on osteopathic manipulative therapy (aka- head squeezing). It looked promising but I couldn’t find any REAL parents that had opinions about it. I was fascinated that after just ONE session of manipulation I could see improvement in Jack’s head. ONE SESSION. It was magic. A newborn baby has a very soft and delicate skull made up of many bones that eventually join to form the adult skull. The flexible skull helps the baby to squeeze out head first through the birth canal. As a result, it is normal for a newborn baby to have a pointy or long head, which eventually changes to the correct shape. Plagiocephaly is a condition where the baby has a lasting flat spot, on the back of the head or on one side. Watch the testimonial below to hear why my patients are elated, understand additional benefits of this type of therapy, and how affordable it can be. “Words can’t express the wonderful care Dr. Banik gave my family. After the birth of our first daughter we struggled with feeding and spit up problems as well as an abnormal shaped head from birth trauma. 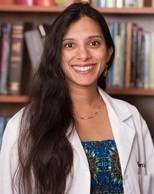 We took our infant to see Dr. Banik monthly for osteopathic treatments and soon noticed dramatic changes in the prior feeding and reflux problems. We also have seen a dramatic difference in the shape of her head – there is no longer a flat spot on the back of her head. We are so thankful for her wonderful treatment” -L.G. Improved ability to look to both sides when they previously favored one side Most people want to know, will this work for me? The only guarantee in medicine is that there are no guarantees. Thankfully, we haven’t had a parent yet who expressed dissatisfaction for their children with plagiocephaly. OMT is a highly successful, hands-on, non-invasive way to diagnose and treat the body. Call our office today to book a FREE discovery session to answer questions you might have, and ensure we all feel comfortable moving forward. If so, we can proceed with treatment on your appointment day. If you don’t like what we have to say, you can always go with just the helmet route. Come see why we have patients are driving from all across the state to get treated. We also work in conjunction with the helmets, and parents have noticed their time in the helmet is less. Don’t know where to start and whom to trust? Come learn from the Ultimate Guide To Plagiocephaly and Torticollis. The most comprehensive guide available online with over 40 referenced, credible science articles which can be found here. Plagiocephaly generally occurs when a baby sleeps in one position most of the time or as a result of traumatic birth. It may sometimes occur before birth, when the mother’s womb is crowded because of twins, fibroids, not having enough amniotic fluid, etc. Plagiocephaly can also occur in premature babies or due to torticollis. Symptoms Symptoms include a flat area on the back or side of the head and scanty hair in that region. This condition may also affect other parts of the head, such as when one ear is positioned forward compared to the other ear. The opposite side of the head may be bulged and the neck, jaw and face may be uneven. Diagnosis Plagiocephaly is diagnosed based on a careful physical examination of your child’s head. X-rays or CT scan may be ordered to rule out other conditions. Treatment Treatment depends on the cause and generally includes a conservative approach. If your child’s sleeping position is the cause of plagiocephaly, you will be advised to regularly change the position of your baby’s head, reduce the time your child lies on their back, and placing the baby on their stomach when awake. In most cases, the condition does not require surgery, responds very well to osteopathic manipulative treatment (OMT), and is a natural way to correct the shape of the head without the use of a helmet. For a list of articles supporting OMT, please click here.